Here ye, here ye! It's Delightfully Noted's 3rd Annual Wicked Craft Week. It's one of my favorite times of the year here on the good ol' bloggity-blog. Every day this week a new blogger will be stopping by to share some delightfully, spooktacular fall or Halloween idea. Here to kick it off with THEE CUTEST TREAT EVER is my ghoul (haha get it?) Michelle. Delightfully Noted's Wicked Craft Week! 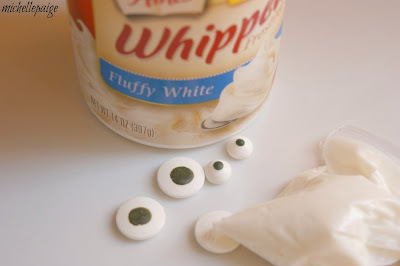 Today, I'm sharing a cute little Halloween treat. 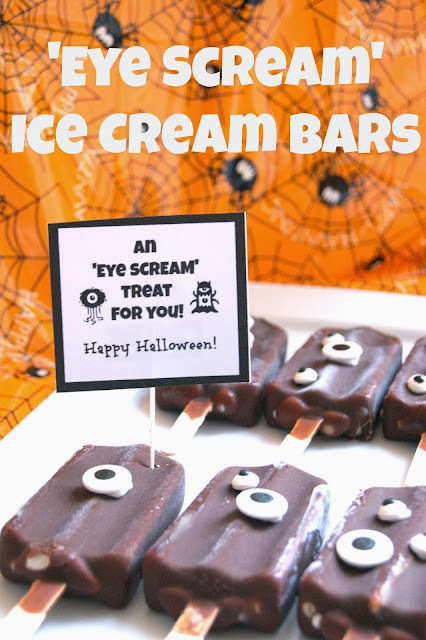 It's an 'Eye Scream' Ice Cream Bar! 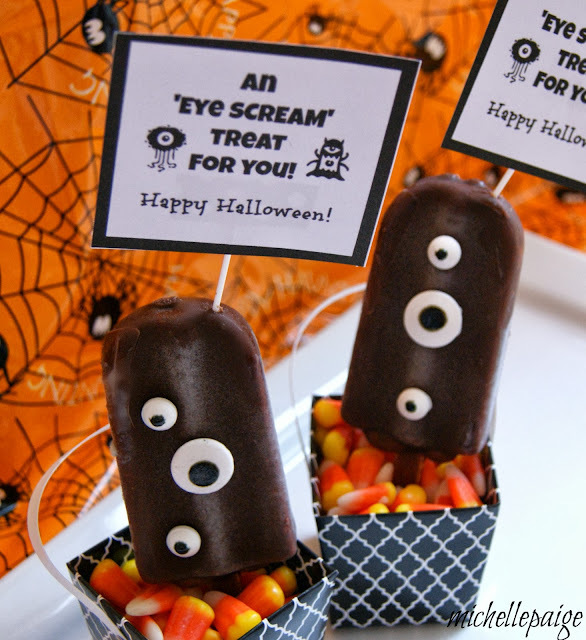 Purchase chocolate covered ice cream bars on a stick, a can of frosting and candy eyeballs. and now they come in different sizes, too! Attach the eyes to the ice cream bars using frosting as glue. I scooped a couple of tablespoons of store bought frosting in a snack size sandwich bag. 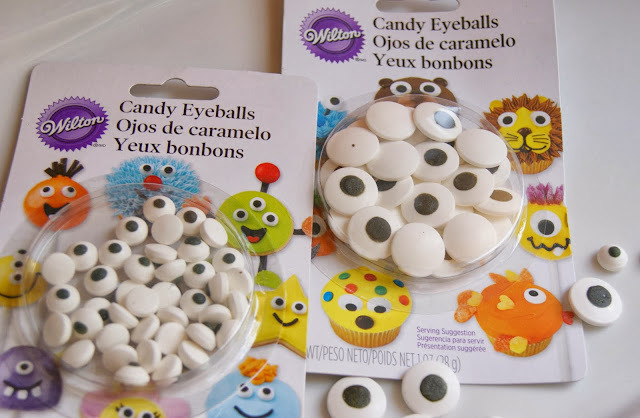 Cut the end off the bag and squirt some frosting on the back of each candy eye. Place each eye on the ice cream bar. Use as many eyes as you'd like! Put the bars back in the freezer until you're ready to serve. 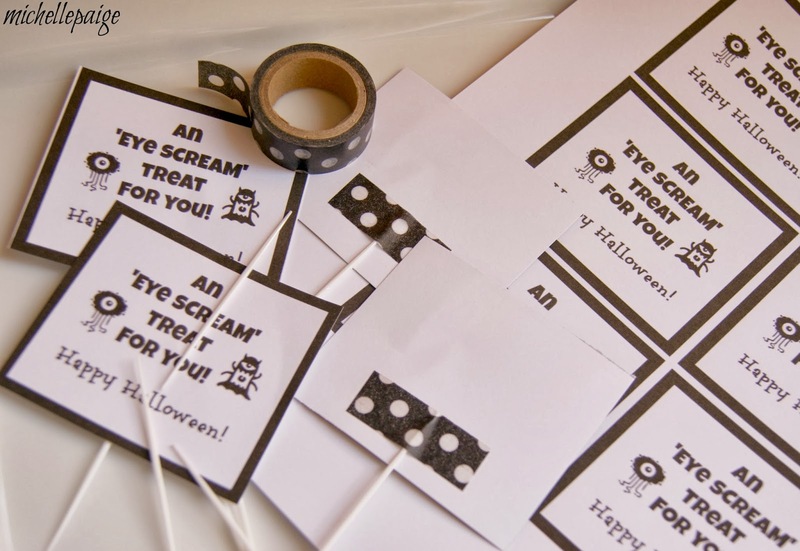 Print out the tags, trim, and tape them to toothpicks. Stick them into the ice cream bars. You can make a tray of these for your Halloween party or make them for dessert for your family. You could even wrap one up in a cellophane bag and stick it in a friend's freezer! The mini, black (take out) boxes filled with candy corn make the perfect container to hold an ice cream bar. I found the boxes at Michaels. 'Eye' believe they'll be a scream! Ha! Thanks for having me, Jennifer! Happy Halloween! Make sure to drop by the rest of the week to see what we have up our sleeves! Love your pun, Jennifer! Thanks for letting me join your Wicked Craft Party!! Think of all the options for candy googly eyes. They would be hilarious on a cheeseburger, or corn on the cob. I'm thinking this is going to be the new craze for "how to get your kids to eat vegetables." This is adorable! My kids would go absolutely crazy over these. Thanks for the fun idea!